The last time I blogged about Netflix, it was over a price increase. And once again, I blog about Netflix as they raise their prices. The above prices are billed to a credit card you have on file with Netflix once a month. You can combine streaming and DVD rental plans by simply adding $7.99 to each of the above plans. I am currently on the 1 DVD out at a time plus streaming plan for $9.99 a month plus local sales tax [I get billed $10.62 every month on my credit card] This was only $7.99 for the 1 DVD out plan, but then they combined the streaming with it, which was nice. But in hindsight, it got me used to getting more for less. And so here is where the outrage and rub down starts. Netflix has done this before with the Blu-Ray… give you it for free for a while, get you hooked on it and used to it, then start charging for it. While this is a great way to promote a new service, it’s a terrible way to deal with the price increase. It’s almost a bait and switch, on a media viewing level. Get you in for the cheap stuff, then once you get it and enjoy it, raise the price on you. No different than many other businesses, but for Netflix, the darling of the tech and consumer world, they take it on the chin rather harshly. Netflix gives the reason for this latest increase in plans as “Given the long life we think DVDs by mail will have, treating DVDs as a $2 add on to our unlimited streaming plan neither makes great financial sense nor satisfies people who just want DVDs” And I happen to agree. The extra $2 a month for unlimited DVD rentals was a killer deal, just not financially viable for the long term. Which brings me to my decision here. Do I continue the 1 DVD out plan with streaming and have my bill go up $6 a month? I see those red envelopes on my TV stand often – sometimes there for weeks at a time and it makes me think about how many DVDs do I watch. The last DVD, the movie Black Swan, sat on the stand for 3 weeks before I watched it last night. Meanwhile, I can watch a streaming movie or TV show on my laptop, Sony PS3 or iPad whenever. Ok, so if these price increases are too much, Netflix does still have too very limited plans for those who really don’t watch a lot of movies each month. As per the above graphic, they don’t give you much, but you also are not paying much, either. Neither of these plans interest me in the least, but to some they may be a great fit for the budget minded. To summarize and given my history and patterns, it’s pretty much been decided that I’m going to downsize my Netflix plan to just the $7.99 a month unlimited streaming. For new release DVDs, Redbox has been finding it’s way into my life. I get free rental codes once a month and at $1 a day, I find that I don’t let the DVD sit around for more than just a few hours before watching it. Netflix’s lack of late charges has made me a lazy DVD viewer. Redbox may retrain me to be more prompt. Plus, I could add the DVD rental to my account anytime if I wanted it for a month or two, not affecting my streaming plan. I know Ren has chimed in on his thoughts on the Netflix price hikes. How about anyone else? How do you use Netflix? Or do you use Redbox? Or maybe you are still with *shudder* Blockbuster. Speak up, readers. I’ve just had the unlimited streaming a few months…but added the unlimited DVDs (the 9.99 plan) two days before they did this. I only planned on doing it a few months before my fall gets crazy, but I’m annoyed they changed it right after. So I’m just gonna have to make sure to switch back to the 7.99 by September. I wish they’d just start transitioning to online only so there were more choices on there. Me, too. I’m sure once they work out better licensing deals with the content owners, we’ll see more of an instant watch selection. I have a bigger problem with people who are losing their minds over the price increase. You’d think $6 was the difference between life and death for some of these people! A Netflix/Redbox combination is perfect. I keep everything organized through Netflix and fill in the gaps with a semi-regular Redbox rental. This works out great. It’s very simple and cost-effective. I feel sorry for people whose lives are so fragile. Agreed. Losing it over this price increase is a but much. Just change the plan to fit how you watch movies. Yes, those that keep both plans will see a rather large percentage of an increase, but $17 is still quite a deal for unlimited movies in two formats. I had lamented that they should let you do the limited DVD rental + the unlimited streaming, which might be good for casual DVD watchers (as you seem to have become) at a better price. In the comments on my post (thanks for the link!) I mentioned that it had eventually occurred to me that the reason for no combo pricing discount might be that Netflix is looking to split up their businesses completely. Combined with the fact that they mentioned separating the business units when they announced the changes, I think this seems very likely. I didn’t see the Starz Play when I looked at the options the other day. I like the idea of this as perhaps they will eventually offer my Holy Grail: HBO Play and Showtime Play! And TNT Play! And more! See? Now I’d be in for an HBO Play and a Showtime play. A lot of the streaming I do is Showtime series, and I currently subscribe to HBO just for the series. Would love to see non cable subscribers of HBO be able to pay for an online only subscription to HBO version of Play! I’d be totally fine with the change if everything I want to watch was on one format or the other. The problem I’m having is that entities like Showtime are not allowing their current catalog to be streaming, so I start out watching “Californication” on streaming, then after season one have to switch to DVD. Weeds was streaming up until season 5. Now we’re watching season 6 on DVD. A lot of stuff I want to see is on DVD only. Then again I’m discovering some great indie films streaming. But I don’t want to spend another $6 a month when I’m trying to save money on our TV “stuff.” We have a paid-in-full subscription that runs out in December. I’ll decide what to do then! I agree. 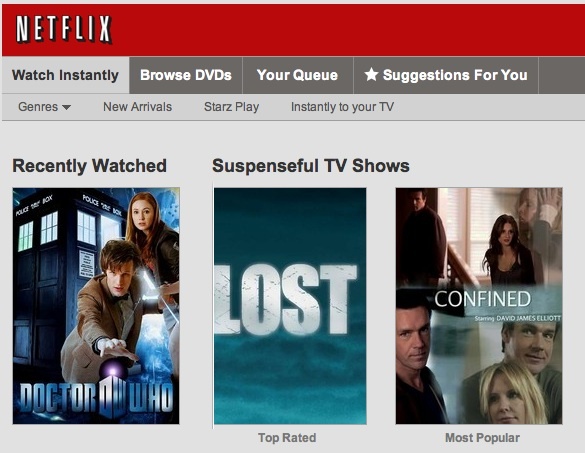 Would be nice to see Showtime offer shows like Dexter and Weeds to online subscribers. Nice that you have a sub until the end of the year. Gives you more time to decide. I chimed in on my blog yesterday. For me, it wasn’t that I was paying for an unlimited streaming plan and getting DVDs as an add-on. I was paying for DVDs and the streaming was something that I used rarely at best mostly because the selection sucked and the HD TiVO I used for playback had terrible A/V. Well, the selection still isn’t up to snuff but A/V has gotten infinitely better since hooking up the Wii to Instant Watch. We’re going down to two DVDs as a result of the change and, if my queue keeps getting smaller and they finally start getting more to watch on Instant Watch, we may drop to one. Changing down to the next lowest DVD out subscription is a smart thing. More instant watch movies will show up, but it’s those licensing deals with the content owners that will be the ultimate final word. I barely ever watch movies, and I am far more likely to watch something immediately, so the 1 DVD per month and unlimited streaming is great for me. Also, I’m just not surprised at all. I mean – it’s what companies do. Yes, price increases every so often are inevitable. If my habits change on watching DVDs in a more timely manner, I’ll add the DVD back into the streaming mix. I’m likely canceling my account altogether. I just don’t use it enough as it is. One option to consider is putting your account on hold. It saves your queue entries for 3 months, I believe. And gives you time to decide if you still want Netflix later on. 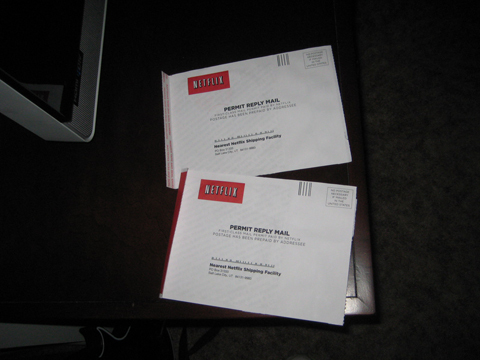 As I think I mentioned on Ren’s blog, we bailed on Netflix back in April. We found that we’d add DVDs to our queue, but when they arrived the moment had passed and we didn’t really fancy watching them anymore. So there they sat in the house for weeks unwatched. And it may have just been me but there were a lot of things that just weren’t available to stream. But, for spur of the moment “let’s watch blah” instances, Redbox wins hands down. Maybe I’ll look at Netflix again at some point but I’m happy with things the way they are and see no reason to change it. See, that’s what we did with our DVDs. My wife is better at watching movies sooner, but it wasn’t the best deal overall, as we ended up paying more for that single rental for 5 weeks. Redbox has found it’s way into our movie watching. Nice, easy and quick. I use the watch instantly a lot. I also use the DVD section and there are some shows and things I have in the queue that I couldn’t find anywhere else. I think that I am going to split the account when the price increase goes into effect and have Vahid pay for one part and I’ll pay for the other. Now that’s a good option… you pay for one, he pays for the other. Both options still available.